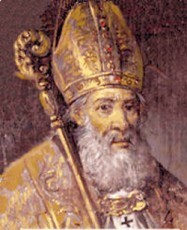 St. Eusebius was born in Sardinia in 283. He is a saint from the early church, and was a lector in Rome. There is a letter from St. Ambrose to the Congregation in Vercelli, two decades after St. Eusebius’s death that recognizes his piety. He eventually became a Priest, and then the first Bishop of Vercelli. At some point in time he led his clergy to form a monastic community modeled on that of the Eastern Cenobites. For this reason the Canons of Regular of St. Augustine honor him along with St. Augustine, as their founder. In the year 354, Pope Liberius asked Eusebius to join Bishop Lucifer of Cagliari in carrying a request to the Emperor Constantius II at Milan, pleading the emperor to convoke a council to end the dissentions over the status of Athanasius of Alexandria. The Synod was held in Milan in 355, and Eusebius attended part of the council, but refused to condemn Athanasius. He was first exiled to Syria, under the watchful eye of Bishop Patrophilus, whom Eusebius calls his jailer. He then went to Cappadocia, and lastly Egypt. Several letters surrounding the council written to or by Eusebius still survive, as do two letters written by him during his exile. On the accession of Julian, the exiled bishops were free to return to their sees in 362. Eusebius attended Athanasius’ synod of 362, which confirmed the Divinity of the Holy Ghost and the orthodox doctrine concerning the Incarnation. Both of these are accredited to his work and teachings. He was a strong defender of the orthodox faith. On his way home from Egypt he continued to visit other churches along the way in the interest of promulgating and enforcing the orthodox faith. Once back in Vercelli in 363, he continued to be a leader in defeating Arianism in the Western Church, and was one of the chief opponents of the Arian bishop of Milan. He died in 371, and his feast day has been set for August 2nd. He is best known for his affirming the Divinity of Jesus, and the Cathedral in Vercelli, Italy is dedicated to him. St. Eusebius sets the example for us from the earliest days of the church that we are to defend the faith. When he was pressured into agreeing with doctrine that was not orthodox, he knew it would have a price to pay – for him, exile. He went into exile and continued to pray and work for the church until he was allowed back. In the end, the doctrine that he so devoutly defended, the Divinity of Christ, has held the test of time. We know that, through the teachings of our church to this day. We can learn a lot from St. Eusebius. No matter what the cost, always defend the faith, and in order to do that, one must know the faith.